Was Churchill Responsible for the Bengal Famine? Madhusree Mukerjee won a Guggenheim fellowship to write her previous book, The Land of Naked People. She has served on the board of editors of Scientific American. She lives near Frankfurt, Germany. On August 4, 1943, Winston Churchill made one of his most important but least known decisions: he declined to send wheat to India, then a British colony, thereby condemning hundreds of thousands, or possibly millions, of people to death by starvation. The inhabitants of Bengal, an eastern province of India where famine was raging, were of little value to the war effort and in any case they were “breeding like rabbits,” he explained at subsequent War Cabinet meetings (as recorded by Leopold Amery, the Secretary of State for India). Churchill chose instead to use the wheat and ships at his disposal to build a stockpile for feeding civilians of the Balkans, whom he hoped to liberate from Nazi occupation. As a result of such considerations, that August the War Cabinet dispatched only a “token” shipment of 50,000 tons of wheat to Ceylon, there to await instructions as to final destination, and ordered for India 100,000 tons of barley—which was of little help because barley had a negligible effect on food prices. It decided instead that around 75,000 tons of Australian wheat would be transported to Ceylon and the Middle East each month for the rest of 1943, to supply the war effort; and a further 170,000 tons would pass by famine-stricken India en-route to a supply center in the Mediterranean region, there to be stored for future consumption in southeastern Europe. By year-end, India did receive 80,000 tons of wheat—far from enough to feed even the army, which continued to consume local grain that might otherwise have helped save the people. Lord Cherwell evidently considered the existence of certain peoples to be justified only to the extent that they served their racial and class superiors—which may explain his reluctance to expend resources on imperial subjects who were unimportant to the war effort. Churchill himself may have subscribed to such a view. After attending one of the War Cabinet debates on sending famine relief, for instance, Field Marshal Wavell noted in his diary that Churchill wanted to feed “only those [Indians] actually fighting or making munitions or working some particular railways.” According to Amery, the prime minister felt that sending succor to Bengalis, whom he regarded as inadequate soldiers, was less important than sending it to Greeks, who were resisting the Nazis. Greece had suffered famine earlier in the war, but the calamity had since passed; in any case, the vast quantities of grain designated for the Balkans could only have been delivered after the Nazis were defeated, and would not impact the course of the war. In 1943, the non-availability of grain forced government-run relief centers in Bengal to reduce the grain rations provided to famine victims to about four ounces a day. That came to 400 calories, at the low end of the scale on which, at much the same time, inmates at Buchenwald were being fed. The Bengal famine drew to an end in late December, when the province harvested its own winter rice crop. The death toll was about 3 million. Let's lay off the ad hom attacks on Amartya Sen. You may disagree with him, but then do not describe him as if he were an ''agent of the British administration''. The man has won a nobel prize in economics, and unlike the peace prize they don't just hand them out to anybody. In fact, Sen does not blame the victims. Even in your description of the theory, you can see that no 'victim' of the famine is blamed. What is blamed is the economy of Bengal during World War Two. Amartya Sen, by the way, did not reduce the death toll to one million, but placed it between 3 and 4 million (see his ''Poverty and Famine'', appendix D). Dyson and Maharatna, in The Indian Economic and Social History Review in 1991, put the total mortality at 2 million. In addition 55 thousand tons of millets came to Bengal, mostly from the United Provinces. Heuer's theory ( citing Padmanavan's paper)that Bengal famine was caused by a rice disease, is not acceptable. I have been to these Rice Research centres in India last March, 2010. They said, at that time in 1943, there was no hybrid rice, thus, research was on how to produce higher grade of rice in the soil conditions of these Rice Research Stations ( Chinsurah was in a damp flood-prone area and Bankura was on a dry draught-prone area). Rice seeds which were under the investigation of these research stations, were of high grade rice, what people use in celebrations, not every day. Their experiments failed in 1943. That cannot prove that the Bengal famine was caused the rice disease as mentioned by Heuer. Amartya Sen cannot be trusted in this matter at all. He has written as if he was an agent of the British administration in Bengal by putting the blames on the victims. In his article in the World Development and Quaterly Journal of Economics, he put forward the theory that some people in Bengal got works in the war efforts, and have started eating too much. That was the reason others got starved to death. It is a disgrace to call him Economist. He also has reduced the number of deaths to just one million. Although it may not be just Winston Churchill, but a group of people of the British administration must take the blame, as Bengal was sealed off from the rest of India, nothing was allowed in to Bengal. At the same time exports of foodgrains were made at the height of the famine from Bengal to the Middle East. most foodgrains and means of transport were confiscated from the people for the fear that they will support the Japanese, accompanied by the Indian National Army ( Amartya Sen has not mentioned the political situation at all). According to the Indian Statistical Institute ( evidence by P.C.Mahalanobis to the Famine Enquiry Commission Report) at least 5 million people were killed in that famine which was man made. Churchill was repeatedly and urgently asked for food shipments by the British authorities in India who thought this were necessary to deal with a raging famine. Churchill repeatedly denied the requests, remarking to his cronies that Indians were contemptible anyway. Mukerjee has shown there was no lack of food or of ships available. All that was lacking was humanity on the part of Churchill, any sense of a duty to what were subjects of the British crown. If all this is not enough to indict Churchill as a major criminal, indifferent to massive numbers of deaths of innocent people under British rule, I wonder what is. The fact is, Churchill was not the benign figure we have all been made to think over the decades. He had a dark and terrible side to him. It is best to come to terms with this, rather than the kind of desperate apologetics that you have indulged in. The Churchill glory story is over. Apologies in the extreme delay in my response. You raise another important point about the failure of relief in Bengal and India itself not mentioned by the author. Even Leo Amery believed that the famine in Greece was worse than the situation in India. Also, Violette Hionidou in ''Famine and Death in Occupied Greece, 1941-1944'', on page 129 to 136 specifically mentions food being delivered to occupied Greece by the Allies. Andy - spot on with your comments. The article also fails to mention that Churchill, perhaps inadvertantly, found the solution to the problem - the new viceroy Wavell, who arrived in October 1943. There was a massive influx of food aid (176,000 tonnes) in the last three months of the famine year 1943. Wavell discovered on his arrival that this was piling up in ports with little attempt to move it to famine-affected districts. Wavell immediately galvanised the relief: using thousands of Commonwealth troops and US aircraft. If Wavell had arrived earlier thousands of lives would have been saved. Had Churchill sent the 'half million tonnes' as requested by the end of the year, they would have arrived after the successful aman harvest of Dec 1943, so made very little difference to the famine death toll, which had peaked in August. Churchill's attitude can be questioned (although ultimately he would send thousands of tonnes of grain in 1944) but not his responsibility for the famine. The fact was Churchill was fighting a world war several thousand miles away - the blame for the famine, and failure of relief lies very much with the Indian and Bengali authorities. I just want to make some comments on this article. Firstly it implies that India received barely any shipments of food grain during the course of the famine; this is not true. Whereas in 1942 India received only 30,000 tons of grain, in 1943 this was 303,000, in 1944 it received 639,000 and in 1945 871,000 [Behrens, Merchant Shipping and the Demands of War, (London: HMSO, 1955), p.356]. The author also does not note that Churchill’s opinions on the famine were contradictory and changed over time. If we are going to quote Churchill’s worst statements on the famine it makes sense to note some of his better ones. Amery reported at a cabinet meeting on May 18th 1945 that Churchill supported Amery’s case for Indian food imports, despite the negative attitude of Leathers. On November 10th 1943 (the same cabinet meeting he made the comparison between Greeks and Indians) Anthony Eden argued that even the 50,000 ‘’token’’ shipment was too much and could damage imports to the Middle East. Churchill overruled Eden. On 12th February Amery recorded that Churchill was stirred by Wavell’s telegrams that he contacted Butler to say that Leathers must try and do something for India. The author focuses on Cherwell’s lecture and speculates (without offering hard evidence) that Churchill may have agreed. Its possible, but then consider Churchill’s telegram to Lord Linlithgow on May 7 1936 in which he writes that he feels sorry for the people of India, particularly as they are faced with near constant hunger and threat of famine [Gilbert, The Coming of War, Companion Documents, pp.143-144]. The major reason behind the Churchill’s (and the cabinet’s) reluctance to meet the demands of the Government of India was the shortage of shipping during 1943 and 1944. These weren’t made up. When a request was made to the United States for help it was also found to be impractical, if not impossible [Foreign Relations of the United States, 1944, The Near East, the South Asia, and Africa, the Far East, pp.272-274]. Lastly, the previous commenter was correct about the need to get the Bengal famine in context. However he did not note the most important context: geography. For this I recommend Mark Tauger’s excellent article ‘’The Indian Famine Crisies of World War II’’. 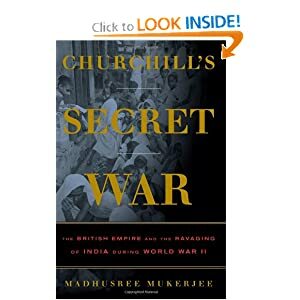 Madhusree Mukerjee's placing responsibility for the Begal famine of 1943 on Wiston Churchill would apear to be something of an oversimplification. Her blaming an individual (whatever his part in this)thereby takes the famine out of social and political context. As argued by Amartya Sen ("Poverty and Faimines" 1981), responsibility for the famine lay in the refusal of the Bengal Government of British ruled India to tackle stockpiling by rice merchants and thereby to interfere with the operation of the'free' capitalist market, leaving poor peasants to die of hunger. There is a good parallel with the similar policies that killed hundreds of thousands in the Irish "Potato Famine" of less than a century earlier in British-ruled Ireland. Throughout that famine the British government refused to take measures to limit the vast exports of wheat from Ireland that continued during the famine,to feed England's consumers, thus, like in Bengal, leaving people to die. Yes, actions by important individuals (such as Churchill in 1943) must be understood but, more so, the capitalist market ideology that motivated them. Unibersity of Kent, Canterbury, UK.